Every year there are an infinite number of different kinds of people that attend con. You have those that are cosplayers, those that are professionals in other categories, sports fanatics, Trekkies, Quidich players, literary gurus, artists of every kind, gamers and anything and everything in between. Everyone comes to con to have a good time. What we do to have fun is as different from one another as we are as individuals. I have always had to travel quite a distance to get to con. In the airport you might not be able to pick out all of the folks going to con, but you sure can pick out a few on your plane. I love sitting in the terminal watching to see who all on my plane I might bump into at con and who I might want to chat with. It is kind of a game that I like to play, "Find the Con-ers". Once we get to Atlanta, they city is all excited about having us there. There are signs welcoming us to their fine city and also to Dragon Con. Pretty cool! It is pretty easy spotting the others like me once in Atlanta...we are EVERYWHERE! One year I decided to take the Atlanta metro called MARTA to the con from the airport. This was quite the adventure trying to navigate with all of my luggage. Now, once on the train there was mishmash of VERY obvious con goers. This was only my second year at con and I was still new and learning about everything. Still, I could pick out my people from the other end of the train. There was this one guy I saw in San Francisco. In San Francisco he had a kindle with him and a shoulder dragon No other luggage. I did not think this was too odd because he could have checked it in. HOWEVER, on MARTA he did not have any other luggage either. UMMM, HMMM, he was on my plane and now on the same train so it is not like he lost his luggage. If that had happened he would be dealing with that still and not be on this train with me. This was soooo STRANGE. Traveling with no luggage at all? HMMMM. I saw him at con a few days later and he was wearing the same clothes...ewwwwww. He was not on the same plane home as I was...thank goodness. I hope he did take a shower a few times while he was there. Needless to say there are all sorts of folks that go to con. 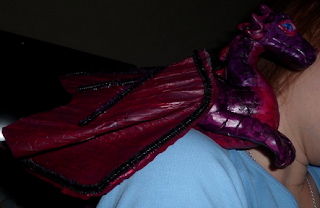 Pic courtesy of google and this is the kind of dragon he was wearing.